This morning we walked from Chamber's Wall to the Oyster Farm and recorded 12 Redwing, 10 Blackbirds, 4 Fieldfare, 15 Magpies, 1 Green Woodpecker, 4 Coot, 2 Golden Plovers, 3 Redshank, 1 Little Grebe, 1 Stonechat, 1 Kingfisher, 22 Dark-bellied Brent Geese, 1 Great Crested Grebe, 43 Mallard, 5 Shelduck, 14 Oystercatchers, 4 Turnstone, 36 Carrion Crows, 2 Snow Buntings flying towards Reculver, 1 female Red-breasted Merganser (91st) flying W, 14 Linnets, 1 Little Egret, 3 Corn Buntings, 1 Marsh Harrier and 2 Goldcrests. Matt was also out this morning and walked from Chamber's Wall and along the railway embankment to the Oyster Farm. His highlights were 1 Firecrest (92nd) on the railway embankment, 105 Corn Buntings, 1 Water Rail (93rd) and 1 Black Swan in with the Mute Swans on the Marsh. On the way home a Merlin flew across the road near Shuart. Tom Speller walked from Reculver to Plumpudding during the afternoon and counted 5 Red-throated Divers, 1 female Red-breasted Merganser, 61 Grey Plovers, 94 Ringed Plovers, 200 Oystercatchers, 19 Curlew, 10 Dunlin, 20 Redshank, 496 Dark-bellied Brent Geese, 5 Shelduck, 45 Mallard, 1 Little Egret, 1 Great Crested Grebe and 2 Marsh Harriers. 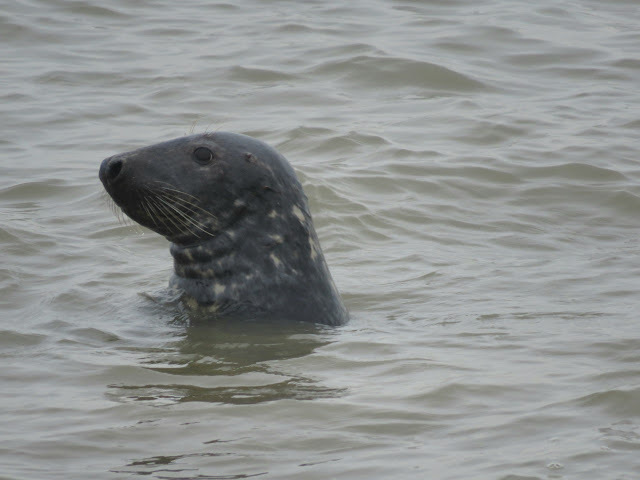 He also saw a bull Grey Seal. Derek Smith walked from Shuart to Plumpudding between 1430 and 1700 and saw 2 Marsh Harriers, 38 Golden Plovers, 1 Barn Owl, 1 Little Owl (94th) calling, 2 Cetti's Warblers and 1 Chiffchaff.